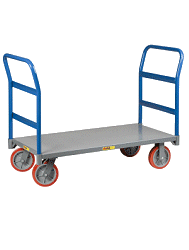 HandTrucksRUs.com > Hand Trucks > Drum Hand Trucks > Harper Drum Hand Truck - 1200 Lbs. DESIGN ENABLES ONE PERSON TO QUICKLY, EASILY AND SAFELY MOVE DRUMS WEIGHING UP TO 1200 LBS. LIFTING TOES CREATE A CRADLE FOR EASY BREAK-OVER. HANDLES DRUMS FROM 21 TO 43 INCHES HIGH. REPLACEABLE CHIME HOOK AND LIFTING TOES ENSURE A LONG PRODUCT LIFE. SPRING-LOADED SWING AXLE KEEPS TRUCK IN UPRIGHT POSITION WHEN NOT IN USE. ALSO AVAILABLE WITH WH 87 AND WH 89P WHEELS. The hand truck we bought from you works great for moving full barrels of honey. I would buy from you again. It sure beats rolling full bait barrels around on their edges.